CU by Day: Happy DSD!!! This week it's not only the usual TGIF, but also Happy Digital Scrapbook Day!! I have a bunch of fun things to share with you today. I have a brand spankin' new CU Grab Bag available at CU Digitals with 5 full sized CU products in it for only $5!! That's 80% off the normal price! Here's the previews of each product since we all like to know what we're buying! I also have the rest of my store on for 40% off! Yup, everything in the store is 40% off All Weekend Long!! And if that isn't enough, I've got a coupon for you that is good for $4 off any purchase of $10 or more!! 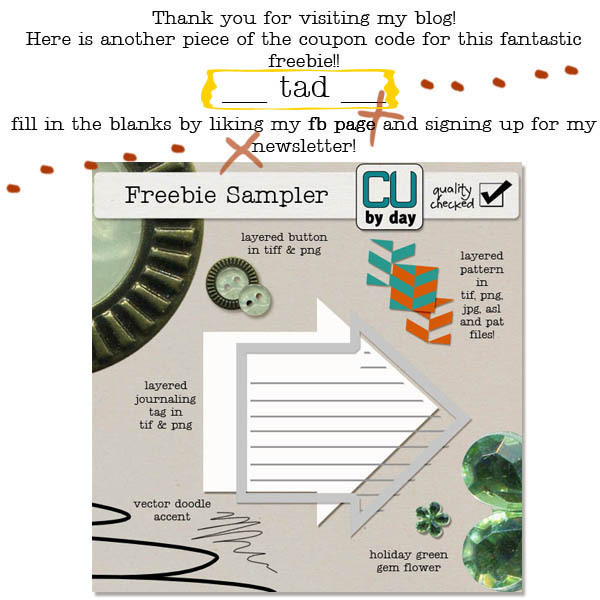 And now, just because it's DSD I even have a treasure hunt for you that ends with a fantastic freebie sampler that includes an add on product to each of the five in my grab bag making that an even sweeter deal!! All you have to do is take the code below, match it with the pieces you'll find when you sign up for my newsletter and like my facebook page!, and then hie it back to my store to download your FREEBIE SAMPLER!! I hope you all have a super fun weekend and I will see you around at some of the games and fun in digiland! Thanks for the fun treasure hunt!! Just downloaded my goodies and can't wait to play! !